St. John's wort (SJW), one of most widely used herbal preparations is known to produce excellent results in relieving mild to moderately severe depression, with virtually no side effects. 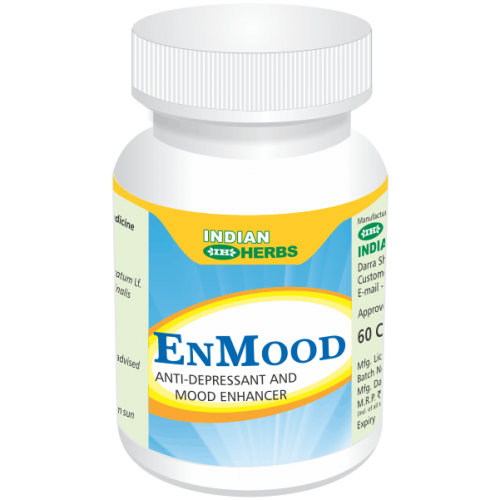 EnMood contains SJW extract standardised to contain Hypericin @ 0.3% alongwith optimum concentrations of Hyperforins and Xanthones which act in synergy to enhance the therapeutic response. Emblica officinalis in EnMood exhibits cascade-type, self-replicating and sustained anti-oxidant action, to scavenge excess free radicals. Hypericin and hyperforins inhibit the reuptake of serotonin, norepinephrine and dopamine in approximately equal amounts and they remain at higher levels in the brain. This mechanism of action is unique and partly accounts for the better efficacy and lower incidence of side effects as compared to synthetic chemical preparations. Many synthetic chemical antidepressants inhibit reuptake of two of the above three brain chemicals e.g., SSRIs and tricyclics usually affect only norepinephrine and serotonin while stimulants increase dopamine and norepinephrine. Journal of Geriatric Psychiatry and Neurology (1994) and British Medical Journal (1996) contained extensive Review Articles and meta-analysis of results of numerous studies on SJW in comparison to synthetic antidepressants including Maprotiline hydrochloride, Imipramine hydrochloride, Bromazepam, Amitriptyline hydrochloride and Desipramine hydrochloride which showed that SJW did better than these antidepressants in eliciting a positive response (63.9% versus 58.5%). The scores on the Hamilton Depression Scale werealso better in patients on SJW. Mild to moderately severe Depression, Anxiety, Seasonal Affective Disorder. 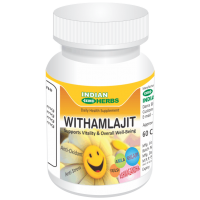 Pre-menstrual tension, Irritable mood and frequent mood variations. To enhance and maintain the Cheerful Mood. Adults : 1 Capsule, twice or thrice daily. Children : 1 Capsule, once daily.